Features: - Armored shields on gun can be assembled for travel or combat. Dropsides and tailgate can be folded down for better crew access. Gun can traverse 360 degrees. Two options provided for customization – one-piece angled plate or overhanging cab armor plate. Two types of front armor plates provided as options. Sharply reproduced on-vehicle tools. Front window armor plates w/photo-etched parts can be assembled open/closed. Driver’s and radio operator’s hatches w/interior detail can be assembled open/closed. Gen2 Kar98k rifles can be mounted in rack. Rifle rack accurately presented. Cannon can be freely posed at different angles. 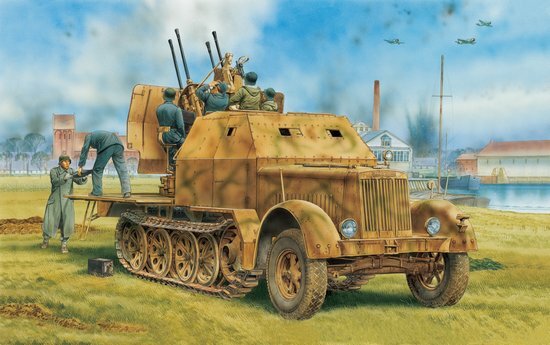 2cm Flakvierling 38 cannon mounted. Slide-molded one-piece gun barrel w/hollow muzzle. Triangular base-plate for gun authentically detailed. Gun shield molded to correct scale thickness. Intricately detailed internal mechanical components: engine, gearbox, fuel tank, compressed-air tank, suspension, exhaust and winch. 6-cylinder engine represented by multiple parts. Delicate engine housing. Gun cradle offers great detail definition. Gun sight and hand wheels w/well-defined detail. Detailed gearbox has multipart assembly. Brake drums have detail on both sides. Finely detailed sub-frame made by slide molds w/muffler and exhaust-pipe assembly. Slide molds enabled one-piece chassis frame w/support-brace detail. Winch assembly w/rope, tow hook and actuator realistically reproduced. Detailed winch spool has bolt and rib detail. Rear crossbeam w/roller and trailer coupling depicted like the real one. Fully detailed steering mechanism. Suspension system as per the real vehicle; slide-molded suspension arms and springs w/delicate detail. Accurately shaped front fenders made from 2-directional slide-molds. Different road wheels rendered w/delicate detail on both sides. Front wheels made from DS have authentic tire tread pattern. Sprocket w/realistic ribbed detail Photo-etched flange around sprocket wheel. Rear mirror realistically presented. Final-drive housing made from separate parts with bolt and rib detail. Optional headlamps provided. Magic Tracks for German halftrack reproduced .Reinforced track links. Recomendado de 14 a 99 años.